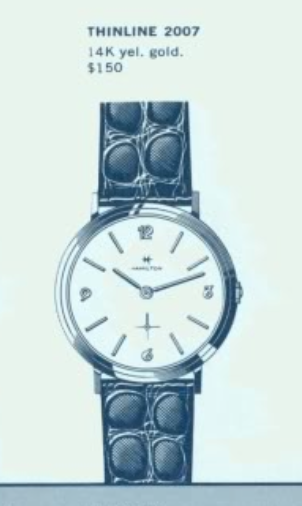 There are a LOT of round watches in Hamilton's line-up and I know some collectors who shy away from round watches because they border on being "boring". I suppose that's true of Elgins or Bulovas, but Hamiltons? Never! Well, maybe that's a little true if you judge a book by it's cover. You really have to look for the subtle differences between round models... maybe it's the movement, the shape of the lugs, or the dial configuration. Sometimes even the bracelet is an important aspect of a model's design aesthetic. Given all of that, it might still be hard to distinguish between models. Take for example the 1962 Rayburn. When I first saw it I thought is was a 1964 Thinline 2007. The Rayburn was made from 1962 through 1969 and was part of the Hamilton's highest-end Masterpiece line. Both models come in a 14K solid gold case and have stepped bezels. Really, the only obvious difference to my eyes in the catalog images is the subtle difference in the shape of the lugs. Ultimately, the easiest way to distinguish the models is the Rayburn has a 22 jewel 770 movement while the Thinline 2007 has a Swiss-made 17 jewel movement. The Rayburn comes in a two-piece case but the design looks a lot like a one-piece design. You need to look very closely for the seam. As I alluded to above, I recently picked up a Rayburn and it took me a while to identify it - there are several very similar models. The shape of the numbers is unique - especially the number 3 - so that helps to narrow the list. As received, the watch was in very nice shape - the crystal is a little scratched but that's an easy fix. The back is engraved with a presentation, from Coopers - one of the "big 8" accounting firms back in the day that is now part of Price Waterhouse Coopers, or PwC as they prefer to be known as today. It took me a while to figure out if it was a two piece case or a one piece. Once I got it separated I noticed the dial had two small scratches by the 1 and 12. Other than that, it looks great. The 22 jewel 770 movement is the best Hamilton made, and I'm always happy to see one of these under the dial as they are very easy to reassemble. While everything is being cleaned in the ultrasonic, I'll prep a new crystal. I like to use PK-style crystals on round watches with sub-second hands. They have a lower profile than PHD-style. PHD is my go-to choice for sweep second movements when a "special" crystal isn't called for (reflector rings, etc). Everything is cleaned and ready to be reassembled. The running movement goes onto the timer. A little tweaking to the regulator leaves the movement running just a smidge fast. I think they tend to slow down a little after everything settles. A new crystal and nice lizard strap complete the overhaul. My light tent and camera reveal every flaw and you can see the two scratches on the dial. I was glad to see the scratches on my "before" shots, as I was afraid I might have done it but that was not the case. Those folks who don't like round watches don't know what they're missing!